You all have GOT to go check out this blog post - Brian Kohler is knitting seven pairs of socks at one time. Genius or madness? You decide! Since I haven't been able to show you anything that I have finished lately, I thought I would share these two FOs belonging to Little Loopy! 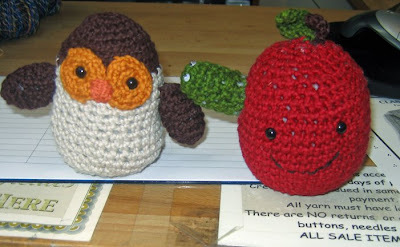 These are from the book Amigurumi World: Seriously Cute Crochet which LL and I both think is adorable. These two are now residing at Stix-n-Stitches in Montclair NJ - the store that commissioned them. I guess that means LL is now a contract crocheter! More yarn came today for a magazine project, and I am busy swatching for a potential new booklet for next year. Will let you know all the details when I can. Been busy booking summer guests for Getting Loopy - Susan Levin, Kathleen from Jelly Yarns, Kim Werker and the Krochet Kids International are all on the schedule - stay tuned! Fun and games at Lion Brand Studio! Thanks to all the Getting Loopy listeners - in fact thanks to EVERYONE - who showed up!